Defence researchers have discovered that caffeine only marginally reduces driver drowsiness but significantly reduces driving errors, according to a fatigue study being presented today at the Australian Psychological Society Conference. Chief Defence Scientist Dr Alex Zelinsky said the study formed part of extensive research into ways of reducing fatigue in both individuals and teams, particularly in Army vehicles. The study examined the effects of caffeinated chewing gum on drowsiness and driving performance on people who were sleep deprived. 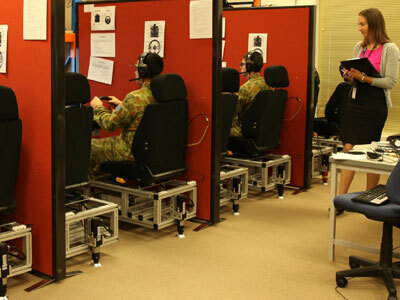 The Defence study was undertaken in partnership with University of South Australia (UniSA) Sleep Research Centre, Walter Reed Army Institute of Research (US) and Monash University Accident Research Centre. DST Group Senior Cognitive Scientist, Psychologist Dr Eugene Aidman, said the research aimed to examine the efficacy of caffeine as a countermeasure against cognitive fatigue – a type of fatigue that’s critical to real-time operator tasks. Fellow Defence researcher Kayla Johnson said “In real life you often don’t have the luxury of stopping when you’re tired, so you need some compensatory strategies to combat cognitive fatigue, and when you’re driving this is particularly important because of road safety”. Participants in the study were kept awake for 50 hours and during this period were required to drive on 15 occasions in a simulated vehicle for 40 minutes each time. Half of the group was given caffeinated gum and the other half a placebo of the same gum with no caffeine. Dr Aidman said caffeinated gum was used to administer the caffeine as it takes only 10 minutes for most of the dose to be absorbed by the brain and lasts for 90 minutes, whereas drinking coffee takes 30-90 minutes to be absorbed for an unpredictable amount of time. The simulated driving study measured levels of drowsiness with a spectacle frame-mounted infra-red sensor registering blink velocity. Lane keeping and speed variability measures were also used to assess driving performance. The researchers found a relationship between growing drowsiness and driving errors in the placebo group. In the caffeine group there was a much lower incidence of driving errors despite the growing drowsiness over the period of sleep deprivation. Dr Zelinsky said this was a collaborative international study with input from researchers in The Technical Cooperation Program (TTCP) involving UK, USA, Canada, NZ and Australia. “While the findings are relevant to Defence, they have significant implications for civilian application such as emergency services and long-haul transport,” Dr Zelinsky said.